Data please Noel. All else is meaningless twaddle. Alex Simmons/RST wrote: blah blah blah. If Jim used his work loop modeling on this example (below) of how the glutes and quads (together with the lower leg muscles) can be used to generate maximal crank torque at TDC and beyond, you would have your data. "All Jim has to do in his lab is sit in an office chair fitted with casters, without arm rests, then pressing down with his hands on the front portion of the sides of the seat, with heel raised on a non slip surface, force that chair backwards (single leg action. That is the basic technique and it's when this forward force is applied to a fast moving pedal that you get the perfect high gear TT technique. It will demonstrate how the powerful calf muscles, ankle and plantar flexion can be put to work in pedalling around TDC, and is very different from the kicking action recommended by the experts. As for bike set-up, the bars need to be in a position that would leave your arm resistance line roughly parallel to that forward force application line between 1 and 1.30 when in the drops position. On my trainer bike I use cut down and rejoined normal bars instead of the Scott Rake aero bars. A model for the work loop tool." Alternatively, if you would read the paper you would understand that the muscles are already doing everything that can be done to produce power. Where shall I send it so you can read rather than speculate? Of course, if your real purpose is to troll rather than to learn or even debate then troll on. backdoor wrote: If Jim used his work loop modeling on this example (below) of how the glutes and quads (together with the lower leg muscles) can be used to generate maximal crank torque at TDC and beyond, you would have your data. PhitBoy wrote: Alternatively, if you would read the paper you would understand that the muscles are already doing everything that can be done to produce power. Where shall I send it so you can read rather than speculate? but you did not mention it was high cadence sprinting that was involved in the study. This meant you would be restricted by time per crank revolution in the muscles and technique that could be used. "We maximized the power that every muscle produced throughout the pedal cycle and came up with patterns that look almost identical to what cyclists do. That means there is nothing else the muscles can do to produce power in some other technique. Any other technique will be less powerful, not more. The differences we saw at the ankle occur during the middle of the recovery portion of the cycle where an active ankle extension would be counter productive. That is, even though soleus could produce more power during that portion of the cycle, doing so would produce negative power on the crank." Got to hand it to you Noel, you never give up. This one seemed really promising for your side and perplexing to me initially. I know Dr. Ettema and he's a solid scientist who trained under Sjøgaard. The issue with this study finally came to me when I was reading the discussion and he was talking about conservation of kinetic energy. "From a power balance standpoint, the athlete does not fully maintain the amount of external kinetic energy (i.e., energy related to the velocity relative to the environment) by generating the same power that is lost due to external resistance." While this is true the effect is minuscule in a moving bike and in a stationary bike with a high inertia flywheel. So that got me to looking more carefully at the methods. They used a Tacx; I-Magic trainer with a small flywheel. So yes, if you are on a trainer with little or no kinetic energy storage the cranks will slow down at the deadspots. Thus, as their data indicate it might be beneficial to minimize the deadspot to keep the cranks moving somewhat fluidly. In fact, one wind trainer brand boasts that it has no momentum (kinetic energy) and that forces you to pedal through the deadspot. But other studies with realistic kinetic energy show the opposite. PhitBoy wrote: Got to hand it to you Noel, you never give up. PhitBoy wrote: So that got me to looking more carefully at the methods. 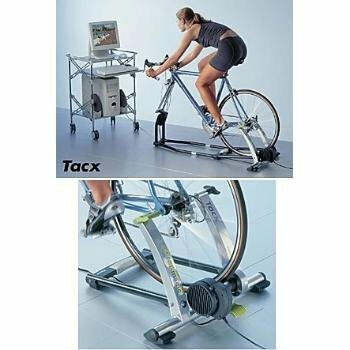 They used a Tacx; I-Magic trainer with a small flywheel. So yes, if you are on a trainer with little or no kinetic energy storage the cranks will slow down at the deadspots. 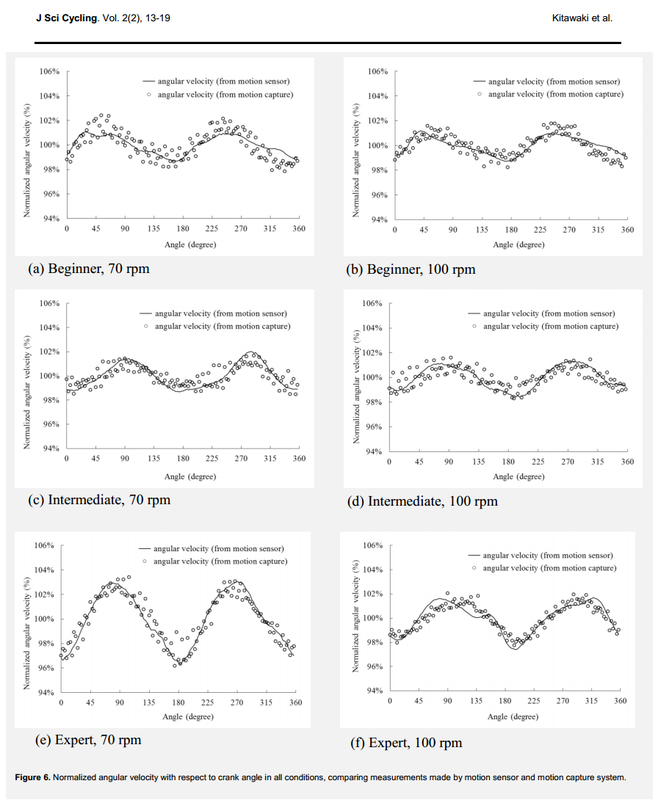 Which is exactly what this study demonstrated, see figure 5 for charts plotting the typical crank velocity variation when using a trainer with low crank inertial load, in this case a CycleOps Powerbeam Pro trainer. I see that study as another waste of research time. What if the application of maximal torque at TDC was brought into the calculation ?
" The lowest work rate (average of top and bottom DC work rate) divided by the average work rate was defined as DC. Thus, this is a parameter describing the evenness of work rate generation; 100% means a perfect circular work rate generation, while 0% indicates that the work rate at the DC equals zero "
Come back when you have some data Noel. Alex Simmons/RST wrote: Come back when you have some data Noel. More of the same with no solution. This man's idea of smooth pedalling is on the right track but needs a few adjustments. For the smoothest possible powerful pedalling over 180 deg. with each leg, the driving force has to start at 330 deg. (11 o'c) and end at 150 deg. (5 o'c). Using both legs this will give the smoothest possible chain drive power from the chainring to the chain. There also should be no gap or overlap because this can only be done by a simultaneous switchover of crank force application from one leg to the other. I love that you come up with all this complicated nonsensical claptrap but when given a solid research paper you respond with "Thanks for the paper, it was too complicated for me to fully understand. " With your passion for science denial and complex nonsense, perhaps you could get rich as a right-wing climate change denier. PhitBoy wrote: I love that you come up with all this complicated nonsensical claptrap but when given a solid research paper you respond with "Thanks for the paper, it was too complicated for me to fully understand. " Yes, a solid research paper, but what does a cyclist gain from it ? TT pedalling is not about maximizing power from the muscles, it's about maximizing sustainable power. So the important question is, how do you switch your pedalling style from maximal power to one that will supply maximal sustainable power. Yes it was very complicated for a person with little or no knowledge of physiology and meant a lot of Google searching. From my search it appears that by making maximal use of the lower leg biarticular muscle around TDC ( impossible with natural pedalling ), most resultant force will come from the ankle to the crank. As for climate change, reopening old coal mines is not going to improve the situation. That's not the limiter to TT power output. Ability to generate/regenerate a supply of ATP is the limiter. There's no free lunch. I agree! The 'pedaling technique' issue is about how to maximize the net power that can be generated (possibly along with aerodynamic concerns) with the amount of ATP that is available. A 'big question' is whether the conventional pedaling style makes best use of the muscles and ATP. Perhaps someone can do a thoughtful examination of the 'muscle usage' details in the paper and see an opportunity to STOP using muscles when they don't produce a worthwhile amount of power for their ATP consumption, and to START using muscles (and joint angles) that would be more effective in power production. It would be a big advance if the 'simulated work loops' modeling can be used proactively to suggest / recommend ways in which the muscles can be used to produce better results. The extremities of the human body contain several bi-articular muscles. The actions produced by muscles at the joints they cross are greatly influenced by joint moment arms and muscle length. These factors are dynamic and subject to change as joint angles are altered. Therefore, to more completely understand the actions of such muscles, the angles of both joints must be manipulated. This report reviews investigations, which have explored the actions of two bi-articular muscles of the lower extremities (gastrocnemius and rectus femoris) as the joints they cross are moved into various combinations of angles. The findings have both clinical and physical performance ramifications. Bi-articular muscles are commonly found in the upper and lower extremities of the human body. These muscles generally cross two joints and influence movement at both. The rectus femoris (RF) spans the hip and knee, and the gastrocnemius (GA) crosses the knee and ankle. The actions of these muscles at their primary joints have been known for well over 100 years. The RF is an extensor of the leg, and the GA is a powerful plantarflexor. The descriptions of these particular actions have been relatively unchanged for many years and appear in most anatomy textbooks. However, these muscle action descriptions do not consider the influence the second joint may have on the muscle’s action at the primary joint, or vice versa. For example, considering the GA action at the ankle, how does the plantarflexion (PF) torque it generates change as the angles of the knee and ankle change? At what combination does muscular insufficiency arise? Advances in technology have made it possible to answer questions of this type, resulting in more detailed descriptions of the bi-articular muscles of the extremities. In our previous papers, we discussed in some detail issues such as muscle tissue, joint moments and moment arms and their effects on bi-articular muscle actions. The GA is one of 14 muscles that act upon the knee, and nine of these, including the GA are bi-articular. However, the GA is only one of these nine that acts on both the knee and ankle, and the others cross the knee and hip. At the knee, the GAs’ actions oppose those of the quadriceps femoris, acting synergistically with the other primary knee flexors (biceps femoris, semitendinosus, semimembranosus, gracilis, popliteus, and sartorius). But it also belongs to another group of muscles that cross the ankle. It opposes the action of the dorsiflexors (e.g., tibialis anterior, extensor digitorum longus and hallucis longus) and it is a powerful plantar flexor working with other posterior leg muscles (e.g., soleus, tibialis posterior, flexor digitorum and hallucis longus). PF forces can be quite high. It is estimated that young males can generate PF torque ranging between 1,000 to 1,780 N.
The GA consists of two heads arising from the posterior aspects of the femoral condyles. These merge into a common belly that rides on the proximal half of the sural aspect of the leg. It shares an insertion with the soleus on the calcaneus via the achilles tendon. The GA and soleus are collectively referred to as the triceps surae and the innervation is supplied by the tibial nerve entering the proximal segments of the muscles. These two muscles provide approximately 80% of force of PF, which is a principal component to a large portion of the gait cycle and essential to nearly all forms of human locomotion. " Instead of using the lower leg as a means of transferring generated power from the knee to the pedal*, the combination of the powerful muscles of the lower and upper leg can replace the dead spot sector with the same torque as that applied between 2-4 o'c. The simple technique of indoor tug o'war is all that's required for this combination of the leg's most powerful muscles. Simulated work loop modeling of the indoor tug o'war technique and its force vectors should give interesting results. When you can get a higher torque return from the same force applied by a natural pedaler, it could be said you are getting a free lunch. *Jim's findings and conclusion drawn from his latest study on natural pedalling, " Thus, during maximal cycling, humans maximize muscle power at the hip and knee, but the ankle acts to transfer (instead of maximize) power. Given that only the timing of muscle stimulation onset and offset were altered, these results suggest that human motor control strategies may optimize muscle activation to maximize power ". * "We maximized the power that every muscle produced throughout the pedal cycle and came up with patterns that look almost identical to what cyclists do. That means there is nothing else the muscles can do to produce power in some other technique. Any other technique will be less powerful, not more. The differences we saw at the ankle occur during the middle of the recovery portion of the cycle where an active ankle extension would be counter productive. That is, even though soleus could produce more power during that portion of the cycle, doing so would produce negative power on the crank." " The action of the calf muscles, including the soleus, is plantar flexion of the foot (that is, they increase the angle between the foot and the leg). They are powerful muscles and are vital in walking, running, and keeping balance. The soleus specifically plays an important role in maintaining standing posture; if not for its constant pull, the body would fall forward. Also, in upright posture, the soleus is responsible for pumping venous blood back into the heart from the periphery, and is often called the skeletal-muscle pump, peripheral heart or the sural (tricipital) pump. Soleus muscles have a higher proportion of slow muscle fibers than many other muscles. In some animals, such as the guinea pig and cat, soleus consists of 100% slow muscle fibers. Human soleus fiber composition is quite variable, containing between 60 and 100% slow fibers. The soleus is the most effective muscle for plantar flexion in a bent knee position *. This is because the gastrocnemius originates on the femur, so bending the leg limits its effective tension. During regular movement (i.e., walking) the soleus is the primary muscle utilized for plantar flexion due to the slow twitch fibers resisting fatigue." * Which makes it ideal for maximal torque through 12 and 1 o'c. By using the interaction of muscles (from hip to ball of foot) and variation of angles at hip, knee and ankle joints, plantar flexion force can be increased and applied in a forward direction at 12 o'c, retaining its force and full tangential effect as it turns downward towards 2 o'c. It's the inclusion of the hip muscles (GM) in the PF force generation that makes PF force adaptable for use in the pedalling technique because apart from increasing the force, it gives the pedaller complete control over its direction. The feet continue to point down because they have to remain set for their powerful plantar flexor mode which can take effect from 11 o'c, the angle of point down depends on the forward/rearward position on saddle. backdoor wrote: Nothing more than basic secondary education, no professional background. Thanks for being so honest. I suspect that your educational background is really at the heart of the debate/disconnect throughout this topic. Several of those of us who are arguing with you have advanced degrees. While that may sound pretentious I'm not saying we have superior knowledge just because of letters behind our name. However, with advanced training comes an understanding of what we do know and what we don't know. Your posts suggest that you don't understand the difference between what you "know" and what you believe. We are presenting research based facts and you responding with your beliefs. Kinda like an atheist arguing with a religious person; the debate goes nowhere. I did say physiologists involved with cycling did not know what their muscles were capable of doing, this excerpt from recent research by Dennis Landin et al. explains why, important information on biarticular muscles was missing from their anatomy text books. It formed the basis of Anquetil's technique. We did not need that information, we succeeded in getting the necessary objectives for our brains to put into action as the muscles applied maximal torque through 12 and 1 o'c. "The extremities of the human body contain several bi-articular muscles. The actions produced by muscles at the joints they cross are greatly influenced by joint moment arms and muscle length. These factors are dynamic and subject to change as joint angles are altered. Therefore, to more completely understand the actions of such muscles, the angles of both joints must be manipulated. This report reviews investigations, which have explored the actions of two bi-articular muscles of the lower extremities (gastrocnemius and rectus femoris) as the joints they cross are moved into various combinations of angles. The findings have both clinical and physical performance ramifications. Bi-articular muscles are commonly found in the upper and lower extremities of the human body. These muscles generally cross two joints and influence movement at both. The rectus femoris (RF) spans the hip and knee, and the gastrocnemius (GA) crosses the knee and ankle. The actions of these muscles at their primary joints have been known for well over 100 years. The RF is an extensor of the leg, and the GA is a powerful plantarflexor. The descriptions of these particular actions have been relatively unchanged for many years and appear in most anatomy textbooks. However, these muscle action descriptions do not consider the influence the second joint may have on the muscle’s action at the primary joint, or vice versa. For example, considering the GA action at the ankle, how does the plantarflexion (PF) torque it generates change as the angles of the knee and ankle change? At what combination does muscular insufficiency arise? Advances in technology have made it possible to answer questions of this type, resulting in more detailed descriptions of the bi-articular muscles of the extremities."